Italian Valley Wraps - A recipe from Savor California, the online showcase for extraordinary gourmet foods and beverages from California. Add zing to your sandwiches by using Valley Wraps instead of plain old bread. This Valley Wrap recipe brings a touch of Italy right to your home! Apply softened cream cheese or other low-moisture spread on a sheet of Valley Wraps. Add thin layer of remaining ingredients or your favorite meats and cheeses, using high-moisture items with care. 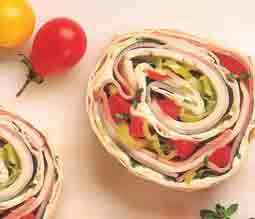 Tightly roll the Valley Wrap jelly-roll style, and wrap snugly in plastic. Allow an extra 6″ of plastic wrap for the ends, and twist to close. Refrigerate at least 4 hours, preferably overnight, before serving. Leave Valley Wrap in plastic wrap until just before serving, and slice into individual servings.